This is a multiple intelligence lesson that incorporates art, science, and theology. I use the classic Into, Through, and Beyond Approach to Teaching. supplies needed-– paper, crayons, computer with Google images up and ready, and a spring day with flowers blossoming. Show kids pictures of summer trees and explain to them about the full leaves. 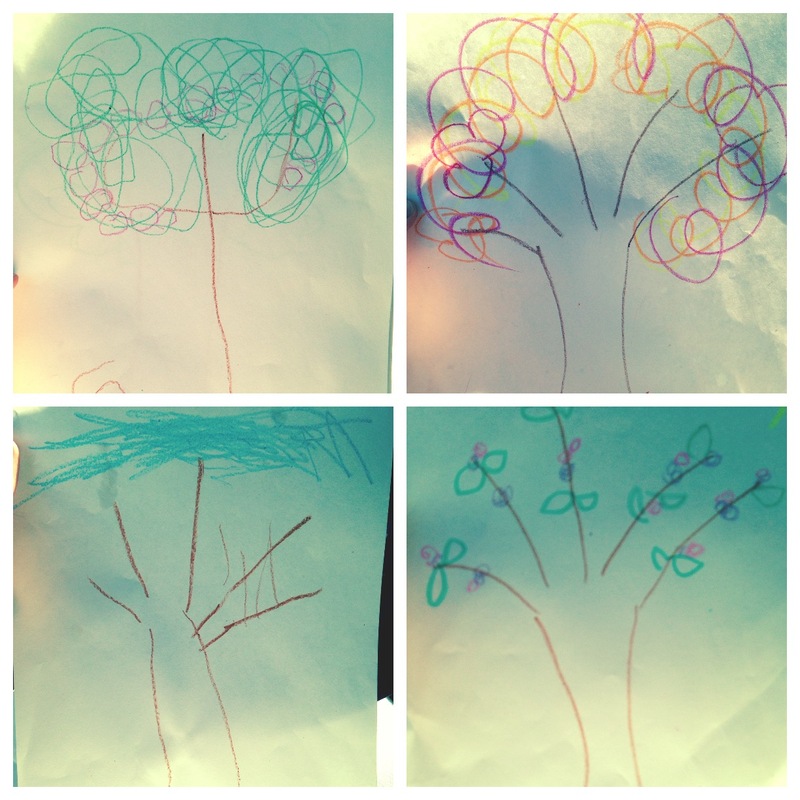 Draw a simple picture of a summer tree and have the kids copy. You can incorporate naming the best colors here as well. We did brown trunk, green leaves, and red apples. Show kids pictures of fall trees and explain what happens to the leaves and why. Draw a simple picture of an autumn tree and have the kids copy. Discuss colors as well. My kids used red, orange, yellow, and brown. Show kids pictures of winter trees and explain what happens to the leaves and why. I discuss how the leaves and flowers die in the fall and the tree looks dead. Show pictures of spring trees and explain what happens to the tree and why. We talked about the leaves and flowers coming back to life. 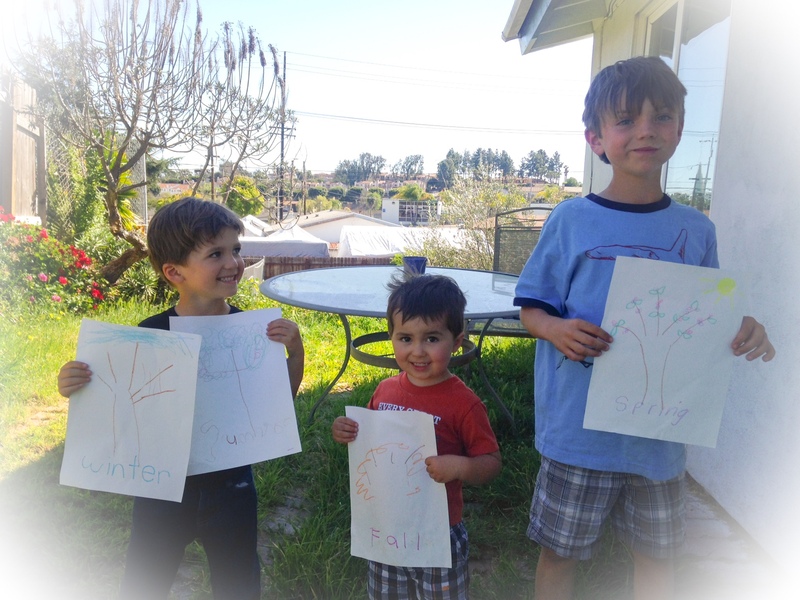 Draw a simple picture of a spring tree and have the kids copy (my kids got tired of drawing trees at this point but were happy to watch me draw mine). 2. Mini-Lecture: Explain to them how Jesus died on a cross on a tree and that three days later he came back to life. Explain that this happened on the Feast of First Fruits which is a Jewish Spring Holy Day at the end of Passover. 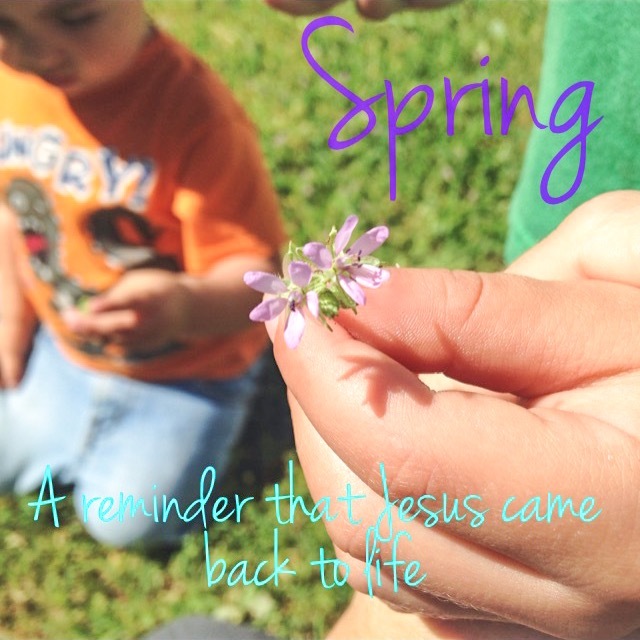 Then tell them that when we see the leaves on the trees sprouting and the flowers blossoming, we know that Spring is here and can remember that God is so powerful he brings the dead back to life. And he did this with Jesus in the spring. Draw a simple picture of Jesus on the cross and Jesus coming out of the tomb. I used stick figures so it was real quick. 3. Lab: Tell them to go outside and look for signs of Spring. 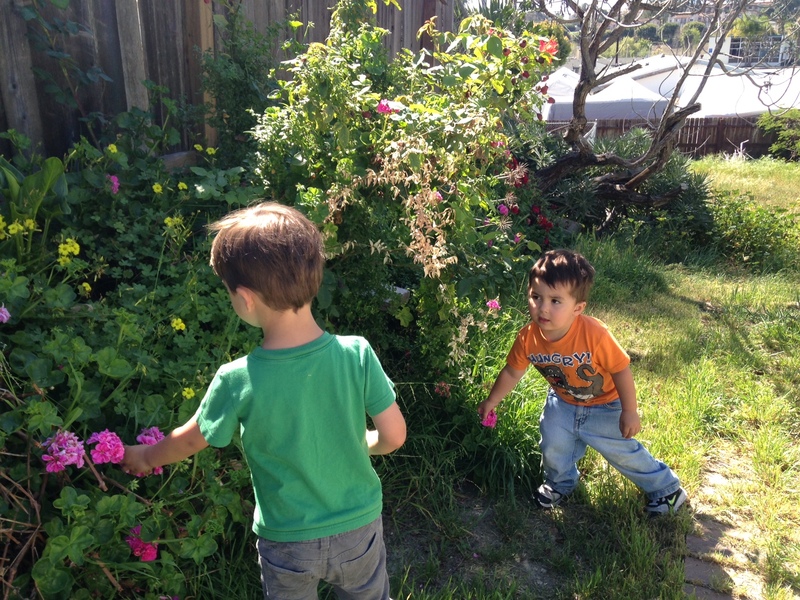 My kids loved going in the backyard and finding all the flowers blossoming. They eagerly screamed– “Jesus is alive!” during this time. Be excited and make it fun for them. Ask them if they find flowers– what does this help us remember? Prompt them to reply if they don’t– Jesus is alive! Beyond–How do you know if they learned it? 4. Lay out the pictures they drew in order from summer, autumn, winter, and spring and then the picture of Jesus on the cross and Jesus coming out of the tomb. Here is a video of my 3 year old son, explaining the pictures and my 2 year old chiming in.